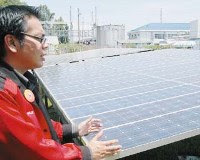 The Daily Express reported that Sabah Electricity Sdn Bhd has set up a Low Energy Office, LEO, using solar power. It was completed in March but announced to the public only last month. At this stage solar power is supplying electricity only to the “test building” itself which is smaller but SESB aims to extend the usage of such alternative power supply to the main office building in the future. By the way, the LEO is located at their Tanjung Aru office. 53 watts – is the energy that one PV cell (PV – photovoltaic) can produce. RM18mil – is required to generate 200kW of energy (to light up 400 houses). RM100,000 – is the cost to build a roof solar panel system. 30 years – is the typical lifespan of solar panel. One can always debate these figures as cost of setting up solar power systems is becoming cheaper every year due to the various incentives from the Government and popularity of this clean energy source. In fact there are still a lot of variations to that figures if we compare them to those implemented at other places in Malaysia. In any case, LEO is the way to go!